An interview with artist Hunt Slonem about collecting plantation houses, the beginnings of modernism and taking his work in new directions. 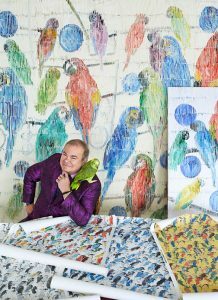 New York-based artist Hunt Slonem is best known for his paintings of repeating animals like bunnies and toucans, but a new exhibit called “Antebellum Pop!” at the LSU Museum of Art in Baton Rouge exposes his passion for design and restoration. Proud owner of two Louisiana plantation homes, Slonem has renovated and filled these spaces with an aesthetic described as Antebellum Pop. Centuries-old antiques pair with modern paint colors, art and Slonem’s own work printed on fabric, carpet and wallpaper. 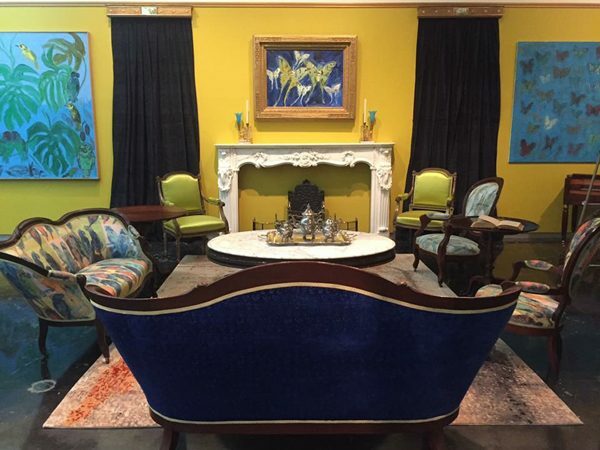 Through August 5, visitors to the exhibit can walk through a re-creation of Slonem’s personal spaces filled with his art, personal furnishing and $2 million in antiques on loan from New Orleans’ M.S. Rau. We interviewed Slonem by email about the exhibit, his plantation homes and following in the footsteps of Andy Warhol when it comes to taking his work to the masses. EZB: How would you describe “Antebellum Pop,” and do you think it’s catching on as a design style? HS: The idea was to discuss what I’ve been doing for the last 14 years, which is renovating two plantation houses in Louisiana — combining bright colors on the walls and the bright colors in my work with antebellum furniture, changing the fabrics on the furniture, and pumping new life and my sensibilities into these 1830s plantation houses. In these interiors, I also combine Southern paintings of the period, mostly portraits, with my work. I wanted to talk about the beginnings of modernism at that time. Things were starting to be machine-made, not mass-produced, but for sale in a contemporary way, by showcasing furniture. There were furniture fairs of the period, similar to the Crystal Palace exhibition that Queen Victoria and Prince Albert did. So Victorian style was seen by more people than it would have been in the past, not just by the rich few. … Playing with color and fabric — the colors used in my houses were used in those days, but now perhaps with my exaggerated point of view. And the repetition is of the time, the way in my work I repeat birds, butterflies, bunnies. What is pop and of the period is the idea of collecting on a large scale, the obsession of Andy Warhol, the repetition, how I’m drawing from items that were for sale in their day and not imported. They were made in America. A lot of the furniture is made in Louisiana by Prudent Mallard and William McCracken, made to order. EZB: How did the concept for this exhibit come about? 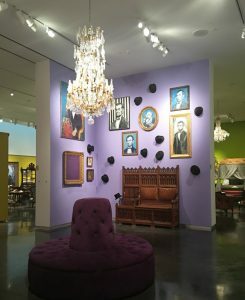 HS: It’s something I’ve been wanting to do forever, ever since my show “Pleasure Palaces: The Art & Homes of Hunt Slonem” at the Ogden Museum of Southern Art in New Orleans. I have a unique personal style of combining these two periods. In that show, I recreated my studio home with collections all lumped together and with walls of top hats, which I also collect. And there was this age of transition, the ’60s, when pop art appeared, and the way it was the beginning of the periods of merchandising to a great number of people. 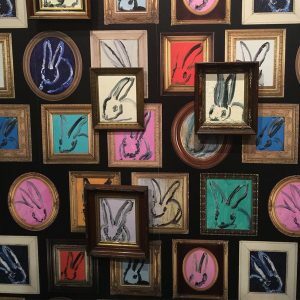 The frames that I used were bought by the dozens, East Lake frames that I frame the rabbits in, and they were mass-produced. Probably almost for the first time in history, houses in America had similarly purchased things, and there were catalogues and advertising. Mostly, this was accomplished through advertising. EZB: Where are your plantation homes located and what has the restoration process on them been like? HS: One house is Albania Plantation, built in 1830 to 1850 by Charles Grevemberg, in Jeanerette, Louisiana, St. Mary’s Parish, on the Bayou Teche. The other house is Lakeside Plantation in Point Coupee Parish in Bachelor, Louisiana. The restoration was an enormous project and is ongoing but nearly complete to a comfort zone of look and function. There was rewiring, replacement of support beams, and re-plastering. Large chunks of plaster used to fall continually, to the point where you couldn’t sleep. We had to re-plaster and rebuild the porches at Albania that were falling down. At Lakeside, I had to restore the pigeonnieres. I rebuilt the original kitchen, with the original foundation as a guide. I had to replace the whole first floor, where the support beams that were all rotten, and put in new floors for the ones that had not been restored since the 1927 flood. So there were a lot of dirt floors on the first floor. And I had to repaint everything multiple times to achieve what I wanted. We put in a lot of brickwork in the courtyards and designed courtyards and fountains at both houses. And I’ve planted maybe 100 live oak trees between the two houses. By the way, the land for Lakeside was given to the Marquis de Lafayette by Thomas Jefferson. Albania plantation was purchased by Isaac Delgado after the turn of the twentieth century. He used the sugar money from the crops grown on the land there to build what was then called the Isaac Delgado Museum of Art, which is now the New Orleans Museum of Art. And he provided the money to build the building as well as his mother’s art collection. EZB: In general, your work is pretty playful and fun. How does that translate with such rare and valuable antiques from M.S. Rau? HS: I picked each piece, and M.S. Rau Antiques was super-generous to loan them. So many people tour my houses, we didn’t want to denude them for five months for the show, so we tried to borrow different pieces for the show, and like with my houses, we selected each piece from offerings from M.S. Rau. It was a wonderful gesture on their part. I was creating an environment to replicate my vision, and it’s a much larger space than the rooms in my house. It’s an enormous space with 20-foot ceilings and much larger spaces than the rooms of the houses. I also upholstered many of my own pieces of furniture to complement pieces borrowed from M.S. Rau. I used the fabrics I did with Groundworks, Lee Jofa. It is a line of fabrics that I’ve done in the last year with images from my work. They are used in my book Art Meets Design, a monograph on my style and vision. I’m thrilled with the pieces that M.S. Rau offered to loan, pieces we couldn’t come up with any other way. M.S. Rau was a very gracious source, filling in the gaps of what we needed to complete the vision of the show. EZB: Images from your paintings are now available as wallpaper, fabric and carpet with handbags and scarves forthcoming. How does it feel to have your work jump off the canvas and take on new forms like this? HS: Keith Haring had the Pop Shop, and he was producing clothing and articles to purchase in the ’80s. Now Damien Hirst is doing wallpapers. Warhol did wallpaper. Images from Warhol’s work have been licensed out since his death. I’m picking up on a tradition of serious art making. Dufy and Picasso worked with Aubusson, as did many artists and ceramic makers in Spain. Miro did murals in tiles. Giant tapestry projects were considered high art. I did a line of tableware with Tiffany. This is an area that has always fascinated with me, working with great masters of the decorative artists. I did a car with Audi. Warhol did cars. Photo credits, from top: Hunt Slonem from huntslonem.com; bunny wallpaper and Antebellum Pop! 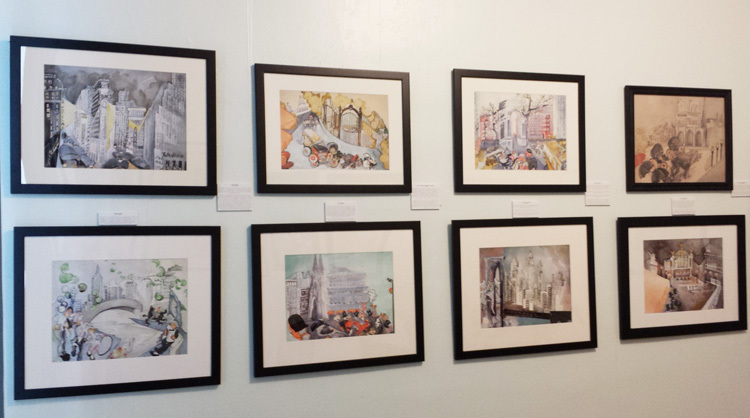 exhibit courtesy of Interior Designer Ellen Kennon.